Hello reader-san! Before we begin I’m compelled to tell you that I’m making some changes to PV Roundup. Foremost, I’m trying to improve my writing style. It’s no secret to me that I have a fetish for really long sentences. Starting with this roundup, I’m doing my best to try and get that under control. Additionally, I feel like I’ve been giving out way too many five star ratings lately. I’m going to start being a little more thoughtful with my ratings. What good is five stars when we see the rating constantly, yeah? Anyway, let’s see how this new effort goes! Personally I really like how these turned out. Feel free to share your thoughts as well. Yoroshiku onegaishimasu. Country Girls’ new single is already a huge win no matter what happens here. “Dou Datte Ii no” was a really fun, upbeat, retro-awesome PV and song. It’s easily in line to be one of my best of the year candidates in the eventual year end ranking podcast, blog post, or whatever. I suppose it’s good that the first A-side was so amazing, because the second half of this single is good, but nowhere near its lead-in. The PV loses points almost right away with these close-up teary shots. I can’t deal with girls crying, man. So much so that I very, very rarely watch graduation concerts, even for girls I love. Luckily, defying the song title, these shots are only used to start off the PV and in a handful of transition shots. I think the tears are in play for some of the solo shots as well, but it’s hard to tell so I won’t count it. When we’re not baww’ing, the PV relies on a relatively small number of different scenes. The group shots consist of scenes where the girls do a fairly simple dance routine with mic stands. It’s pleasant enough to look at and theme-fitting, but largely unmemorable. There’s also a collection of solo shots that alternate between closeups and upper body shots. It’s hard to complain about looking at cute girls too much, but these shots are also a bit uneventful. The outfits for this one keep in line with their recent retro shtick, featuring tops that borrow style from a stereotypical American high school athletic jacket, complete with the almighty red white and blue, and frilly skirts that could easily fit in with a 50s cafe. They’re nice to look at but lack flair of any kind. 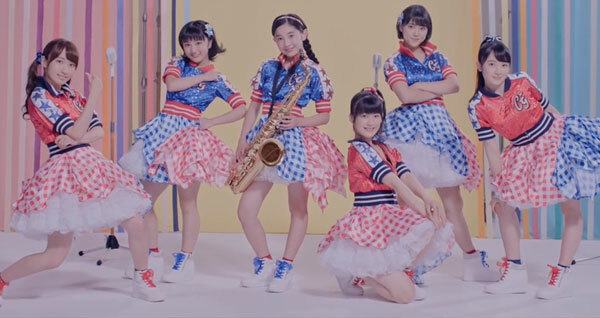 Probably the highlight of the PV is the scenes with Yanagawa Nanami playing the saxophone. There’s also a few charming scenes of forced perspective utilizing the sax. These are the parts of the PV projecting some personality, and it’s a fun use of a talent she actually has in real life. If I may show a little bias here, Nanami’s solo shots are also some of the more memorable ones of the PV. This girl has amazing stage presence for her age. She’ll definitely be one of H!P’s superstars in the years to come. I’m sure of it. That’s really it for the PV. Everything else is just there, more or less. The camerawork is good but doesn’t really move around much. There’s some transitional effects that don’t really stand out either way. The only real use of CGI to enhance a scene is a few forced perspective shots laden with cartoon-like effects. It’s subtle to the point of being almost unnoticeable. It’s a cute enough PV, totally enjoyable, but just not up to the high bar of their previous recent work. I feel mostly the same about the song. It’s a nice tune that closely follows their recent retro trend, but the melody is really forgettable, the vocals are noticeably monotonous, and the instrumentals are in pretty generic waters. Again, enjoyable, just not much wow factor. Country Girls’ 4th single drops September 28th.